The new flag of Cambridgeshire has been announced. 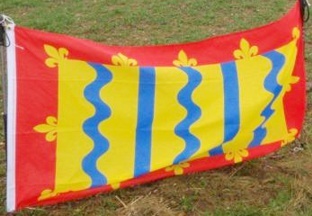 More information at this link https://andystrangeway.wordpress.com/2015/02/01/brady-ells-wins-the-cambridgeshire-flag-competition/. The design by Brady Ells has three gold crowns to represent East Anglia, in which Cambridgeshire is located. They are placed against a blue field which is the same shade used on the East Anglia flag. The wavy lines represent the River Cam and are in the colours of Cambridge University. This flag belongs to Cambridgeshire County Council and can only be used by CCC or those given permission by CCC to use it.